I bought this Smith & Wesson Model 41 new about 5 months ago. 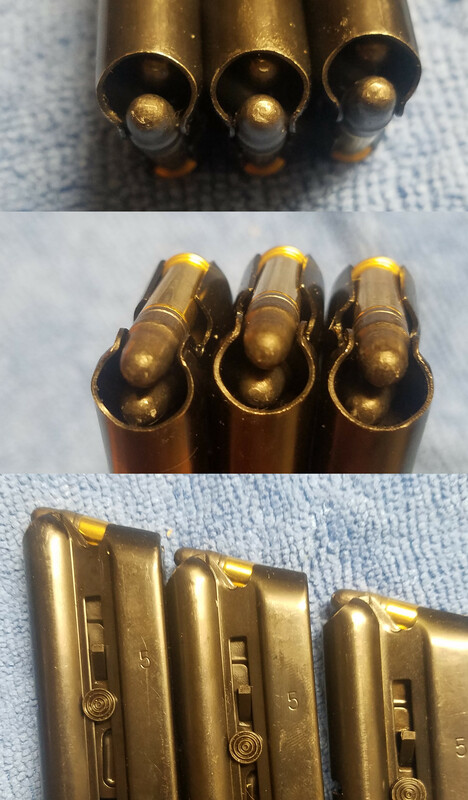 Today I noticed that as a round is chambered from the magazine, the rim of the cartridge scrapes along the top of the next round in the magazine, deforming the bullet. This happens 100% of the time. That can't be right? 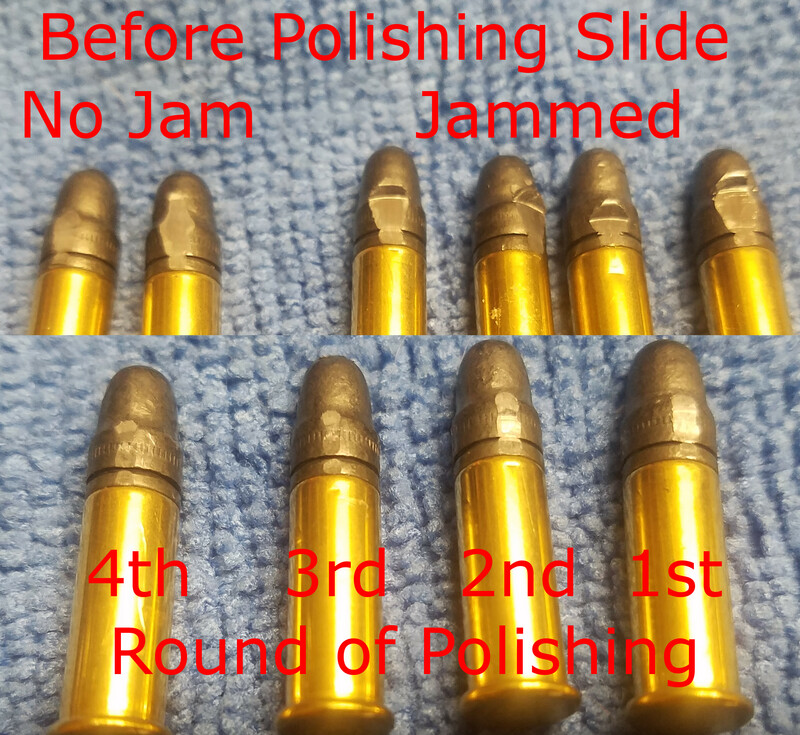 In the case of the round at the bottom of the picture, the first round didn't chamber all the way because its rim got caught on the 2nd round in the magazine. This is CCI standard velocity ammo. Factory magazines. Only thing I can think of is too much magazine spring tension. I have a 41 and a large number of magazines, old, mid-vintage and new. Metal and plastic followers. All with factory springs. Never seen anything like this. 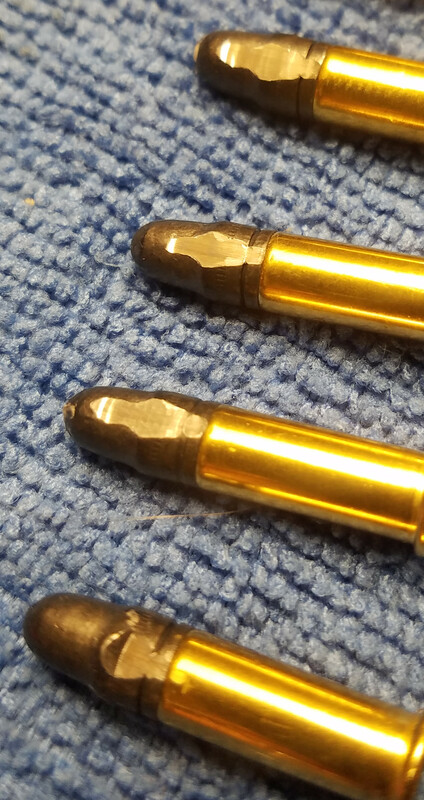 The amount of spring pressure needed to deform lead bullets like this is significant, to the point of making it difficult to load the magazines. My only suggestion is to replace the springs with factory or Wolff springs. I'd go so far as to say someone may have installed non-41 springs. Check the boltface and extractor. Anything keeping the rim from sliding up? Some photos of the tops of the mags, loaded and unloaded, please. Jack H wrote: Check the boltface and extractor. Anything keeping the rim from sliding up? Looks OK. Just cleaned the gun today. These are all factory magazines, that came with the gun, that I bought online, and that I bought retail in a store. Most of the rounds I've shot through this gun have been Wolf Match Target. The rest have been CCI SV. 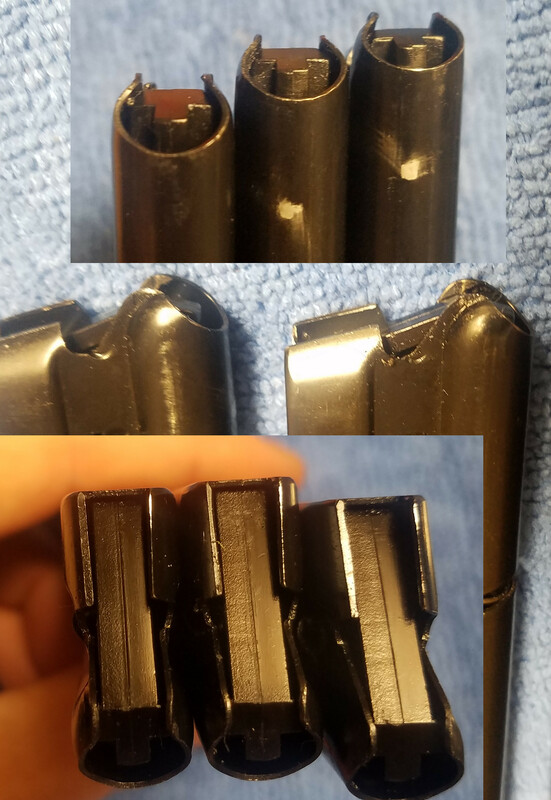 I'd had some intermittent issues with FTF and FTE, so I tried the "drop of light Rem Oil on the first round in each magazine" trick. That got it to about 95% functionality. I just figured it would need a few hundred rounds to break in. 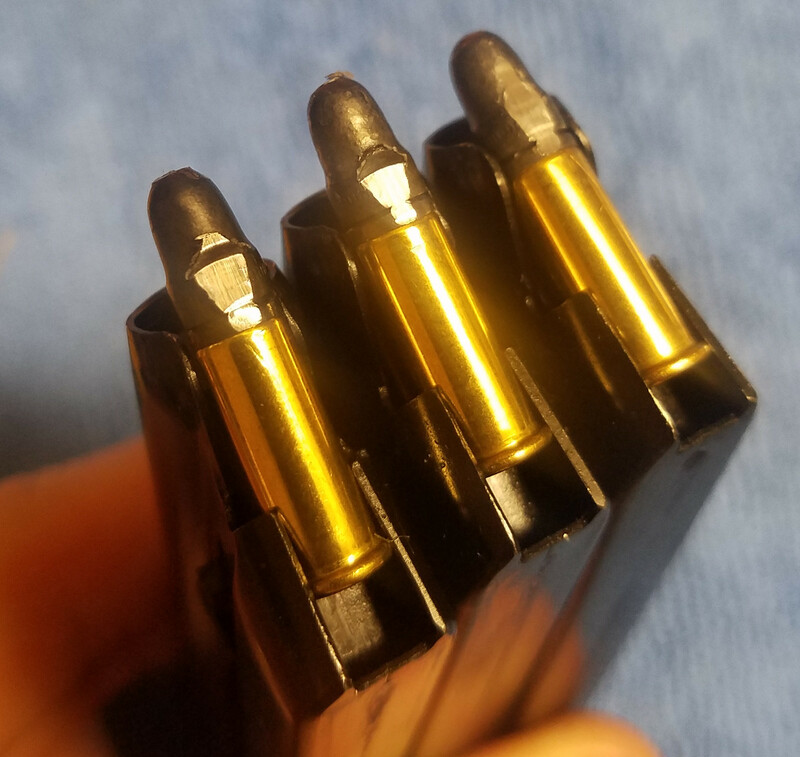 After chambering the first round (slide all the way back, released abruptly, not slowly ridden forward), these were the #2 rounds left in the magazine. Two of the three didn't feed all the way and got hung up on the 2nd bullet. 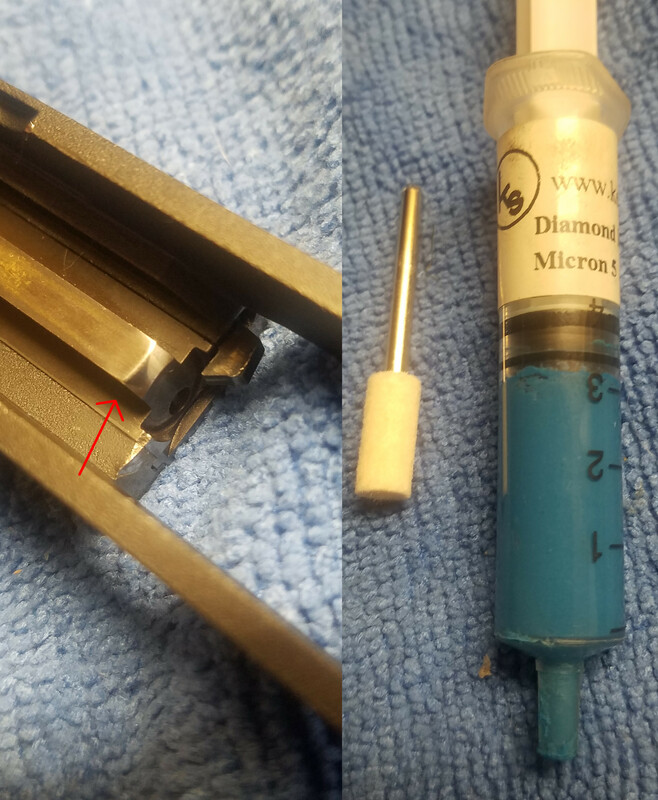 For this test and these pictures, I did not add the usual drop of Rem Oil to the 1st round. Did they all get drug forward? I mean are they starting out all the way in the back of the magazine. I am so used to a 52 that I tap all my magazines on the bench to make sure they are all back as far as possible. That 1/4" behind the bullet that is not touching is what bothers me. The rim above should be long gone for that far forward scrape. Is the slide somehow doing this? Jack H wrote: The rim above should be long gone for that far forward scrape. Is the slide somehow doing this? I agree with this. The rounded rim of a 22 would have a hard time gouging the lead like that, and I say almost impossible to do with the rim. My bet is that it's the bottom of the bolt in the slide is doing that damage. Check to see if the bottom of the bolt has a radius or sufficient chamfer to it. I agree with Jack. To me it looks like the lower edge of bolt face / slide scraping the next round. Try some older magazines that might fit differently and sit a little lower in magazine well. See what happens with them. My 41 will do the exact same thing if I cycle it manually. If I just release the slide holder and let the slide slam shut, just like it does when shooting it does not do that. I don't know why and never figured it out. thessler wrote: My 41 will do the exact same thing if I cycle it manually. Given the above and the fact you said you did sling shot it, could it be that you have a very weak recoil spring and the bolt is just cycling too slow? Looks like you're right. 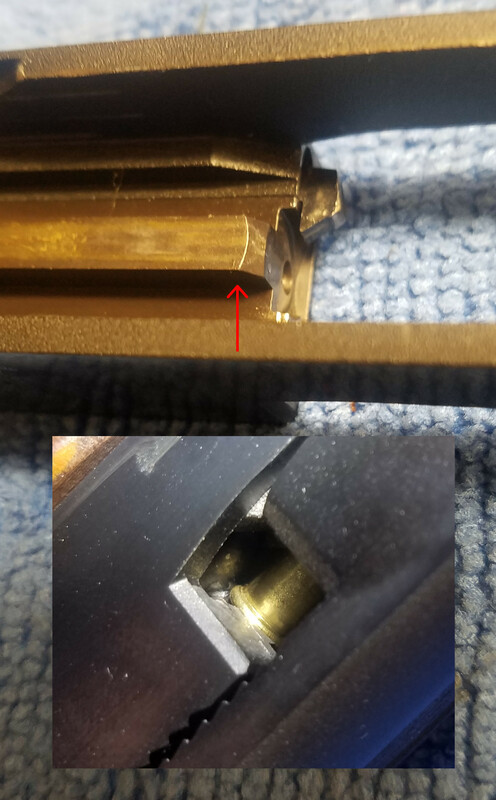 I just assumed it was the rim of the top round in the magazine doing it, but the scrapes are very flat. I looked at a jam again - this picture shows it's not the rim of cartridge hanging up, but the slide. So what can I do about this? polish and round the edge with the arrow? I don't want to damage the slide and create a different problem. The breech bolt is replaceable. Before you do anything, you might want to pick up a spare. It is a pretty easy install. I just did it on my 1988 vintage Model 41. I found it is easier to put back together if you don't drift the cross pin out all the way. I did a few cycles of very gentle polishing of that sharp edge with a Dremel, cotton polishing bit, and 5 micron polishing paste. It is much, much better. No feeding jams with function testing now. The bullets still get a little scrape, but nothing like before. I think it could use a little more rounding of that edge, but I think I'll just leave it alone for now. I'm going to go to the range now and run a couple hundred rounds through it without cleaning or the drop-of-oil trick, and see if the FTF errors are truly fixed. I would adjust the lips of 1 magazine, bending them in .002" at a time to keep the bullets nose down more. See if it helps. May not be all the slides fault. Sold my 41, but here are measurement of a High Standard. Check the ammos rim diameter. Should not be larger the .278"
Does the case head slide up the bolt face freely and under the extractor. If slowed on feeding, the bullet nose may sit higher in the magazine, or nose up. Sticking with my weak recoil spring/timing possibility. Have you tried a new recoil spring? Just got back from the range. Shot 160 rounds of CCI SV and Wolf MT through it. I started off with a bunch of timed fire drills, 5 rounds per magazine. No FTF jams or other feeding issues. I didn't use the drop-of-oil trick, and I didn't clean anything during the session. Taking off that sharp edge seems to have solved the problem. I did have a FTE with the first magazine, however. After that, no issues. Anyway, finished off with 20 rounds of slow fire at 25 yards. 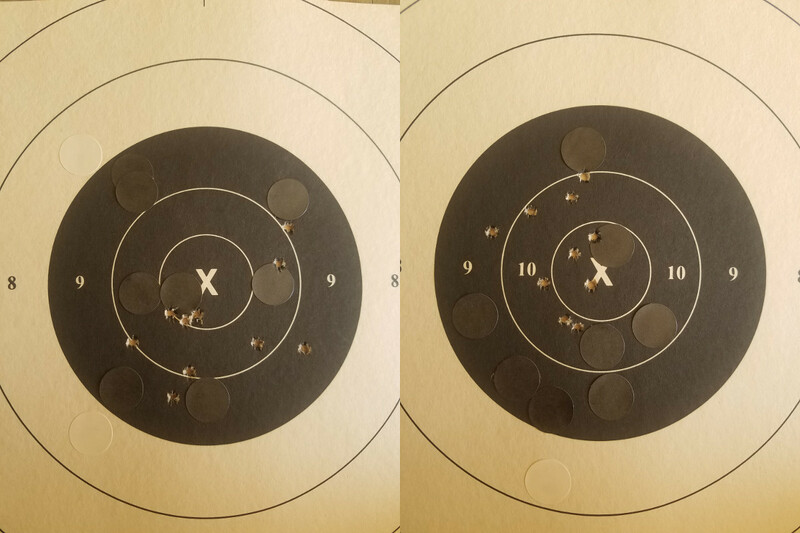 Still stuck on 1-7 of the Marine Corps workbook (two consecutive targets with 10 shots in the 10 ring) ... but I'm getting there.